The divergence begins where Victor allows himself to listen to Reed's warnings about miscalculating his numbers and agrees to let Reed be his assistant. They succeed in reaching the netherworld, and Victor manages to confirm that his mother is trapped in Hell after using witchcraft. 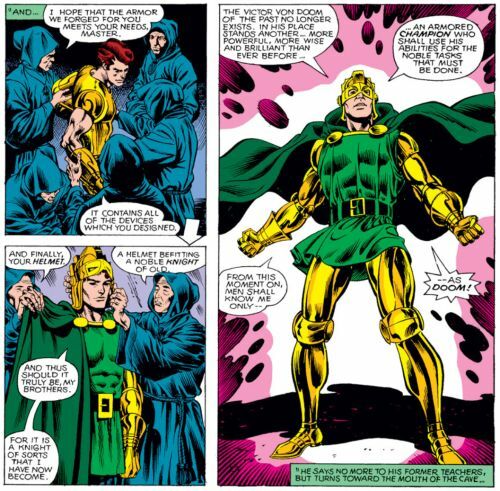 Doom turns his attention to Latveria, where the Baron who sentenced Doom's father to death has since died, leaving the country under the heel of the cruel Prince Rudolfo, who heavily taxes his citizens and treats them like slaves. As Prince Rudolfo tries to flee, one of the soldiers bullets ricochet's off of Doom's personal force field, mortally wounding the prince. The happy newlyweds drive through the loving crowd, only for everyone save Doom to suddenly vanish, leaving Doom alone in a bleak, desolate wasteland. Mephisto appears and reveals what happened to his citizens. As promised, Doom is returned to Latveria where everyone has been returned... save for Valeria. Doom leaves the confused townsfolk, saying that he will give them his services whenever they ask, but for now wishes to be alone. Hold on... A What If...? where Doom becomes a hero actually has him staying heroic, and not turning into his regular self? I do believe that actually qualifies as a shocking twist! Well considering that he sold out his wife to Mephisto because of some conceited notion that "The world NEEDS Victor Von Doom", I think heroic might be a bit iffy here. Still, I love this story, It goes to show that even when Doom is a good guy, some flaws are still there. In fairness, it seems to be a "needs of the many outweigh the needs of the few" kind of situation. Plus, as we see, Doom is able to put up a fight each year to reclaim Valeria; would she have been able to do the same as effectively? On the other hand, Reed Richards and all the other genius's are out there, and he doesn't even seem to consider them (and here, he acknowledges Reed's intelligence). Also, poor, poor Victor, ah. Poor Rudolfo. That final line of his could easily have been punctuated with a Homer-Simpson-style annoyed grunt. So, how did Doom reclaim his mother's soul if not by Mephisto's own rules, then? He went to a specific mountain just the right place at the right time, brewed everything he needed, said the incantation, and did it. ...Yeah, it's not explained very well. Though to be fair, Mephisto stated (to himself, so we're reasonably sure he's not lying) that only he had the ability to do so, so maybe Doom exploited some loophole or something. I wouldn't put it past Mephisto to lie to himself, if only because someone might be listening when he talks to himself.. It reminds me of a quote from an early Ghost Rider comic. "I'm the devil! Everything I say is a lie. Including that." Way back in the 1980s, I was into the Marvel Super Heroes RPG -- the original one, with the FASERIP system and so on. One of the adventures released for that game, 'Gates of What If,' specifically spun off from this issue. In it, Doom and Richards work together to correct his calculations, as in this issue -- but the machine explodes anyway, slightly scarring Victor... and killing Reed. It was a fascinating module, and I still slightly regret that I never found a regular group I could play it with. What Ifs have always been favorites of mine, and they did a good job with the world-building in this one. Yeah, I really enjoyed reading that one. Mutants were admired due to their role in defeating the Skrulls, Spider-Man seen as one of the great heroes of the war for his sacrifice, Doom's ultimate plan to deal with Mephisto... It's a great read, and I imagine, a lot of fun to play. Europeans are clearly a quaint lot. I love the idea that, even as a hero, Doom's most overriding personality trait is still his ego/love of himself. I'm going to just pretend this story ended on the page with the wedding.
" Vanity. Definitely my favorite sin. " And then Mephisto starts laughing to the tune of Paint It Black. So was Gustav doomed to live out the rest of his life as a giant frog? I still think of this as the best What If? ever. Though in retrospect decades later, I do question Mephisto actually being able to do what he threatens/does in this story. The established limitations to his power would lead me to believe that while he might have been able to claim Victor's soul in recompense for stealing Cynthia's away from him, the innocent souls of all the other Latverians would have been off limits.